Moon Pies are yet another de rigueur food item at the Masters. 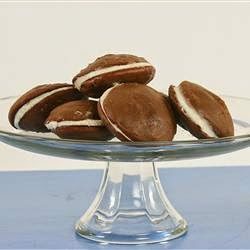 They scream “SOUTHERN” and are good, but….this homemade version is better! 1/2 cup butter, softened 1 cup white sugar 1 egg 1 cup evaporated milk 1 tsp vanilla extract 2 cups all-purpose flour 1/2 tsp salt 1/2 cup unsweetened cocoa powder 1 1/2 tsp baking soda 1/2 tsp baking powder 1/2 cup butter, softened 1 cup confectioners’ sugar 1/2 tsp vanilla extract 1 cup marshmallow creme Preheat oven to 400 degrees F. Lightly grease a cookie sheet. To Make Cookie Crusts: In a large mixing bowl, cream together 1/2 cup butter or margarine and white sugar. Add egg, evaporated milk, and vanilla. Mix well. In a separate bowl, mix together flour, salt, cocoa powder, baking soda, and baking powder. Add flour mixture slowly to sugar mixture while stirring. Mix just until all ingredients are combined. Drop the dough onto greased cookie sheet by rounded tablespoonfuls. Leave at least 3 inches in between each one; dough will spread as it bakes. Bake in preheated oven for 6 to 8 minutes, until firm when pressed with finger. Allow to cool at least one hour before filling. To Make Marshmallow Filling: In a medium mixing bowl, blend together 1/2 cup butter or margarine, confectioners’ sugar, flavored extract, and marshmallow creme. Mix until smooth. Assemble pies by spreading 1 to 2 tablespoonfuls of filling on flat side of a cookie crust, then covering filling with flat side of another cookie crust.